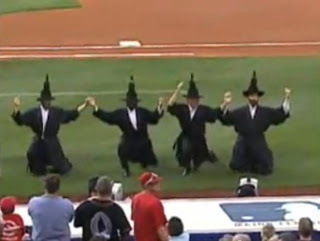 For the last two seasons, The Amazing Bottle Dancers have joined The Philadelphia Phillies in honoring the Jewish community during their Jewish Heritage Celebration at Citizens Bank Park. 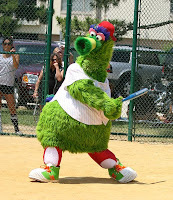 Their performance has been a huge hit with the teams, their fans... and The Philly Phanatic! And they've been invited back for this year's Jewish Heritage Night when the Phillies play the Los Angeles Dodgers in Citizens Bank Park on Thursday, August 12. Although we are not actually Orthodox, Michael hails from a long line of Orthodox Rabbis and Chazzans. His great grandfather was Rabbi Nathan (Nachum) Wechsler. Michael's grandfather and uncle -- Cantor Max Wechsler and Cantor Sol Wechsler, both of whom were Modern Orthodox -- were renowned in Brooklyn, and up-and-down the entire eastern seaboard. So whether you're planning to be in Philadelphia on August 12 or not, take a few minutes to enjoy the antics of the Amazing Bottle Dancers. Enjoy!